Each document is associated with a Profile. Profiles represent a set of indexes that provide information about the document. When importing a document to Docsvault, you must specify a profile. Once you have selected the appropriate profile, you may need to enter additional information about the document. The document profile is stored with the document indexes. To change the profile associated with a document, you can either change it when you check the document in or edit the document properties. 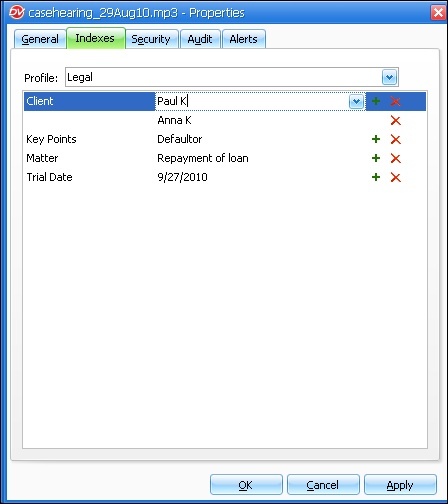 Profiles and indexes can be set to documents, as well as to folders. 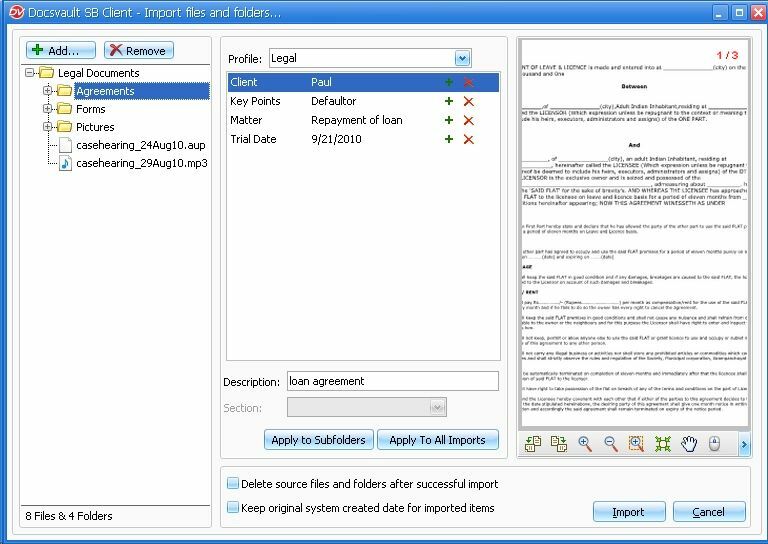 •You can assign a profile to the documents in Import files and folders dialog, which is displayed when documents are imported into Docsvault. •Select a Profile from the drop down list. •Enter values to the corresponding index. You can add multiple values for a index by clicking on the plus sign. •Apply to Subfolders will apply the indexes values to the subfolders imported. •Apply To All Imports will apply the indexes values to all the documents imported. •When File Name Template is associated with any Profile, files and folders are automatically named based on the index values. Similarly file descriptions and notes can be populated with a combination of predefined information and/or index values entered by users. •Profiles and properties fields are present in scanning interface. 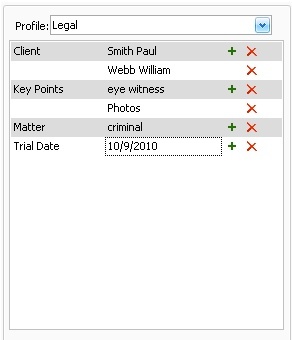 Assign a profile and corresponding property values before saving the scanned images. •Select a document, folder or cabinet from Docsvault Explorer. •From the Edit menu, click on Indexes. displayed in the index-value table. •Assign appropriate values to the indexes. •Click on OK button to save the changes. •When a document is copied or moved to some other location within Docsvault, the profile associated with it and all its corresponding property values will persist only if the destination folder has the same profile. However, User will Set Available Profile rights have permission to change the profile type assigned to documents. •You can now also display the Profile properties of your documents in the Details view . For more information, see Customizing Column Configuration. You can assign multiple values to an index. •Click on the Add sign button to add the more than one value to an index. •Click on the Delete sign button delete a index value. When a user starts to type in a index field, Docsvault will display options to fill in the field based on earlier typed values. Upon the prompt you can select the options and press [Enter] to accept the value. If you wish to have your values automatically completed in the index value field itself, enable AutoComplete from Tools > Options > Others dialog. Docsvault allows you to delete previously entered values from the value suggestions list. To delete any value, simply click the 'x' that appears when you hover your mouse over the value.